About UK-DC, providing demolition, construction and building services to Gloucestershire and the surrounding counties. The company was formed by its Managing Director Reg Daldry, and since its conception the company has grown in both size and reputation, now partnering with some of the UK’s premier companies within the construction industry. UK-DC pride themselves in offering a range of demolition and construction services at competitive prices, and with an experienced and qualified team of construction experts, we guarantee that the job we do will always be completed to the clients exacting requirements leaving them happy with the end result. 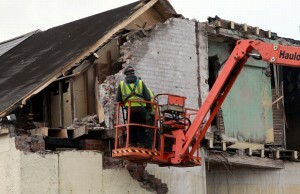 All demolition works, including managing asbestos removal where required. Building works, from walls and outbuildings, to extensions and new builds. Groundworks, including trenches, drainage and footings. If you are looking for a construction company to provide you with a reliable service at a competitive price, delivering excellent workmanship then look no further than UK-DC. We look forward to working with you very soon.